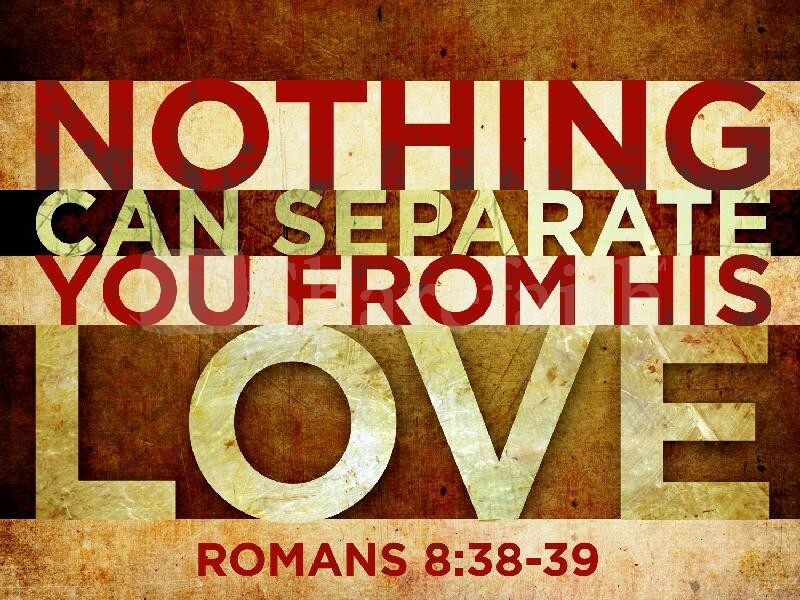 Nothing can separate you from My love, says the Lord! Nothing! My love is constant. My love for you is unconditional! I loved you while you were yet in your sins, says the Lord. I loved you enough to pay the price for your redemption with My own shed blood when I gave My life for you on the cross. You were that precious to Me before you even knew Me, and you are priceless to Me now. You are MY prize possession, and no one can pluck you out of My hands. When you were lost, I found you. When you were weak, I strengthened you and kept you from falling. When you thought all was lost, I rescued you just on time, to secure you and protect you. I have been with you every step of the way: providing, keeping, helping, comforting and healing you! Even when you thought I was absent, I was there! You have never been alone and never out of My sight. I have made a way for you every time when you could not see your way through. I have been with you through every long, lonely, midnight hour, guarding and enveloping you. The times when you were sure that you could not survive, I was there to lift you. You made it! That was MY power that sustained you through those times. I carried you when the evil one tried to blow you away. Every crisis you faced became a testimony of My presence and power in your life, says the Lord. What you are facing now is NO different! It is NOT to difficult for Me! I Am the changeless One! I Am your Almighty God! I created the very ground you walk upon. The silver and the gold belongs to Me! I know where it is at, says the Lord. I know what you have need of before you ask. Go ahead and ask ME, because I will answer you! Call upon My name! I will never turn My back upon you, and I cannot and will not forsake you. Trust Me at all times! Nothing and no one is bigger than ME, says the Lord. Your Goliath cannot scare or threaten Me, and I am not going to permit his threats to be carried out against you. I Am with you to save and protect and defend you, and I will feed you until you are fat and full of My blessings. Yes, I Am a God of a bountiful, inexhaustible supply! When the enemy comes in like a flood I lift My hands up in resistance against Him. I draw the line that cannot be crossed and I secure you within MY BORDERS! The enemy can shout and stomp his ugly feet and threaten and you can just stand still within the borders of My protection and keeping where you are safe from all harm. HE dare not confront Me, and since you are Mine, I Am the One He is coming against, not you! I Am his biggest nightmare, while being YOUR sweet dreams come true! Do you see the difference? You are My beloved, and nothing can separate you from ME! Did you hear that? NOTHING CAN SEPARATE YOU FROM ME, and when you have ME, you have all that belongs to ME! That includes every need that you have and far beyond your wildest expectations, for I Am El Shaddai, your God that is MORE THAN ENOUGH! You will never be without Me, so you will never go without. I will meet all your need according to My riches that be in glory, and I have it ALL, says the Lord, and I HAVE YOU!